IPL 2019 Auction is finished and we witnessed some surprising bidding. 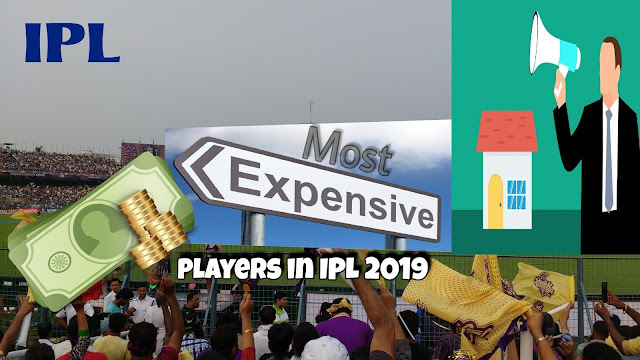 Now here is IPL 2019 most expensive players after Auction of IPL 2019. The Auction was held on 18th December in the Pink city, Jaipur and it brought many surprises. This was the day for new upcoming players. The teenage and uncapped players got the top spot in IPL 2019 Most Expensive Player's list. While there are some big names went unsold like Brendon McCullum, Alex Hales, and Cheteswar Pujara. Here's take a look at the most expensive players in IPL 2019. Getting the highest bid of 11.5 crores by Rajasthan Royals last year but being the most expensive player he didn't serve well to Rajasthan Royals. He did not take wickets as expected and gave plenty of runs. In IPL Season 11 he took 11 wickets in 15 matches with the economy rate of 9.85. So the franchise decided to release him. But again he was bought by Rajasthan Royals only after a bidding war in 8.4 crores and once again became the most expensive player of IPL 2019. The reason behind this is his recent performance. Playing in Vijay Hazare trophy he took 16 wickets in 8 matches and also he is having a lot of experience on Indian pitches. It will be quite interesting to see that, will he be able to justify his value this year in IPL 2019 as being the most expensive player of IPL 2019? Well, this is the most surprising name of IPL 2019. After the Auction of IPL 2019, everyone is googling like who is Varun Chakravarthy? Why Varun Chakravarthy is the most expensive player of IPL 2019. Nobody is familiar with this name. His base price was 20 lacs and he got sold for 8.4 cr which is 42 times of his base price. A bidding war started for him and finally, KXIP bought him for a huge amount of 8.4 crores. Varun is basically from Tamilnadu. He has done Architect course from SRM University Chennai and was working as a building designer in Chennai. But then he decided to go with his passion and join Crombest Cricket club and a seam-bowling all-rounder. He is being called a mystery spinner. Last year he took 31 wickets in 7 games with the economy rate of 3.06. He is good with the bat also. In Vijay Hazare trophy he took 22 wickets just in 9 matches with the economy rate of 4.23. So these abilities make him IPL 2019 Most Expensive Player. What is your opinion about Varun Chakravarthy being the most expensive player in IPL 2019? Sam Curran is the most expensive player of IPL 2019 as an Overseas player. Sam Curran is the younger brother of English bowler Tom Curran. Sam has made his debut in Internation in this year only. Sam is a very young player and he is an all-rounder. So we hope that he will prove his value as the most expensive player in IPL 2019. Colin Ingram is a top order batsman of South Africa. Currently, he is the caption of Glamorgan Country Cricket. He was bought by Delhi Capitals. He has a lot of experience in different kind of pitches. So let's see how good he will be after being in the list of the most expensive players in IPL 2019. We all remember that ICC T20 world cup 2016 where he smashed 4 consecutive sixes which is the reason that West Indies lifted the ICC T20 world cup trophy. He is picked by Kolkata Knight Riders this year for a big amount of 5 crores and taking place in the list of the most expensive players in IPL 2019. Playing for West Indies, Braithwaite has scored 266 runs in 33 T20s and bagged 28 wickets. His biggest strength is his quick scoring batting. Braithwaite was playing for Sunrisers Hyderabad last year but he was struggling for his good form in the whole season. So Sunrisers Hyderabad decided to release this all-rounder. So Kolkata Knight Riders have shown trust in him by bidding on him as one of the IPL 2019 Most Expensive Players. Another name of the uncapped Indian players in the list of the most expensive players in IPL 2019. He made his first-class debut in 2017 for Mumbai in Ranji Trophy. In the first inning, he took 5 wickets haul. After that playing for Mumbai, he scored his maiden century and took another 5 wicket haul. On 17th December 2018, playing for Mumbai in Ranji Trophy, he smashed 5 consecutive sixes. Royal Challengers Banglore bought him by bidding 25 times of his base price which was 20 lacs. Thus Shivam Dube is in the list of the most expensive players in IPL 2019. After being the only player retained by KXIP in mega Auction, Axar Patel had an unfortunate year. He was unable to play due to injuries. Before Injuries, he was doing great. He grabbed 61 wickets in 68 matches before the injury with the economy of 8. He is good with the bat also sometimes as he bats with the strike rate above 125. Delhi Capitals have shown trust in him after buying him as one of the most the most expensive players in IPL 2019. Mohit used to play for Chennai Super Kings. After 4 years he is being united with the CSK he must be very happy. Last IPL season he played for Kings XI Punjab. He is a fast bowler and can pick wickets in powerplay overs. Playing 110 T20s, Mohit Sharma took 109 wickets. Chennai Super Kings didn't make a lot of changes in their team. They bought just two players in the auction of IPL 2019. Chennai Super Kings brought back their old player after bidding him as one of the most expensive players in IPL 2019. Mohammed Shami is a right arm fast medium bowler of the Indian team. He has a lot of experience with different players. He has been playing for the Indian Cricket Team for a long time. Mohammed Shami is also known as reverse swing specialist. After playing 52 ODI, Mohammed Shami took 94 wickets with the economy rate of 5.55. No doubt he is a wise purchase and he deserves to be in the list of the most expensive players in IPL 2019. As we have seen that IPL 2019 Auction was full of surprises, there comes one more surprise Prabhsimran Singh. Prabhsimran Singh is wicketkeeper-batsman from Punjab. He is the cousin of Mumbai Indians player Anmolpreet Singh, who is more popular than him. Prabhsimran Came in limelight after scoring 298 runs against Amritsar in the district Cricket tournament. He is also one of the new surprises who are on the list of the most expensive players in IPL 2019. So that is the top 10 list of the most expensive players in IPL 2019 Auction. There were total 60 players sold in the IPL 2019 Auction, in which there are 40 Indian players and 20 overseas players. In the list of top 10 most expensive players in IPL 2019, there are 7 Indian and 3 Overseas players.